Boasting an array of new technologies, Audi’s third generation flagship, the A8, stepped into the limelight at Miami’s Design Week. 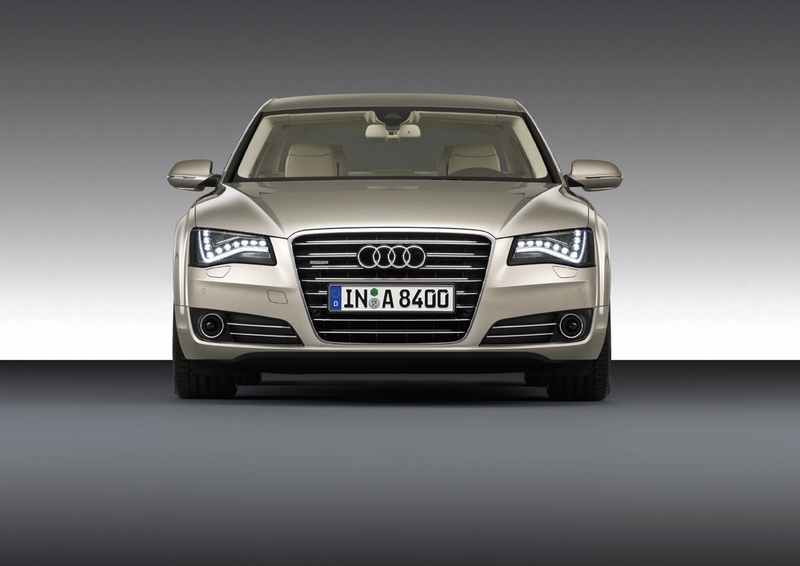 The third generation Audi A8 retains it’s subtle and conservative design. Gracefully sculpted contours contrast sharp lines and create a harmonious form, continued with a sleek roofline. The four rings are prominently displayed on the large chrome-trimmed front grille, and neatly integrates with the car’s character lines. The design contributes to achieving a low drag coefficient of just 0.26 allows the A8 to slice through air. 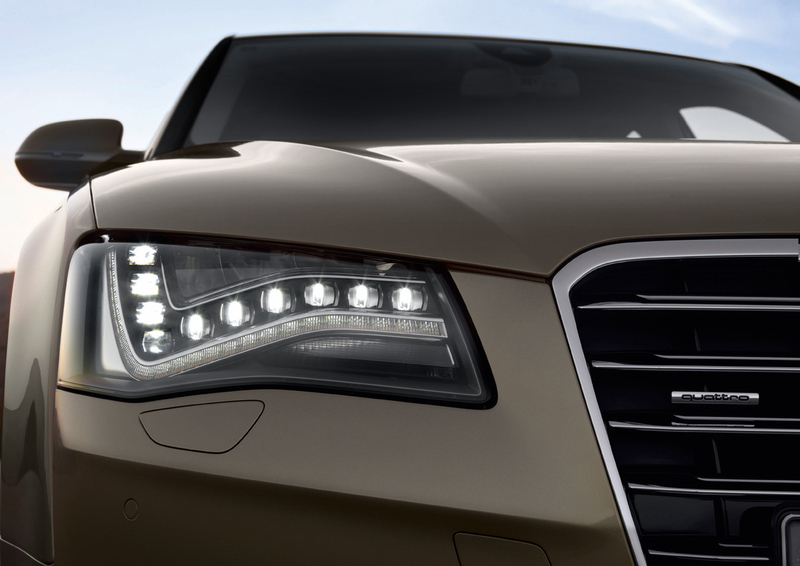 Like other Audi’s the A8 receives the R8 LED treatment. 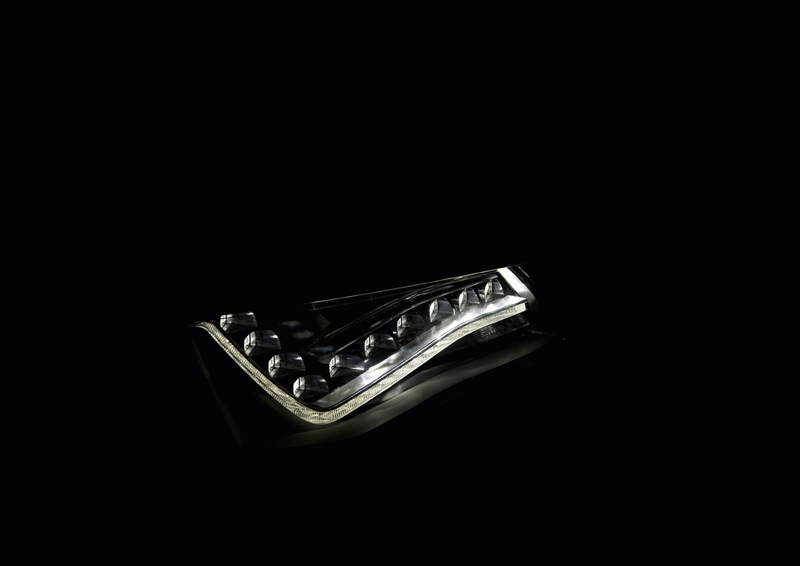 An arc of 22 white and yellow LED’s appear as a single light bar, forming the turn signals and daytime running lights. 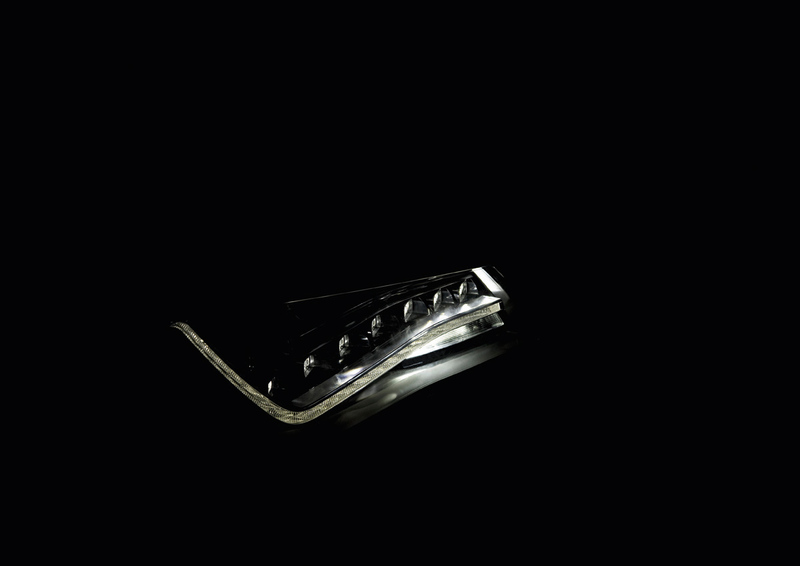 Situated on top of the daytime running lights are the low beams, comprised of ten light modules known as the “wing”. While the LED lighting and large front grill form a distinct appearance, the design of the A8 remains conservative and elegant. 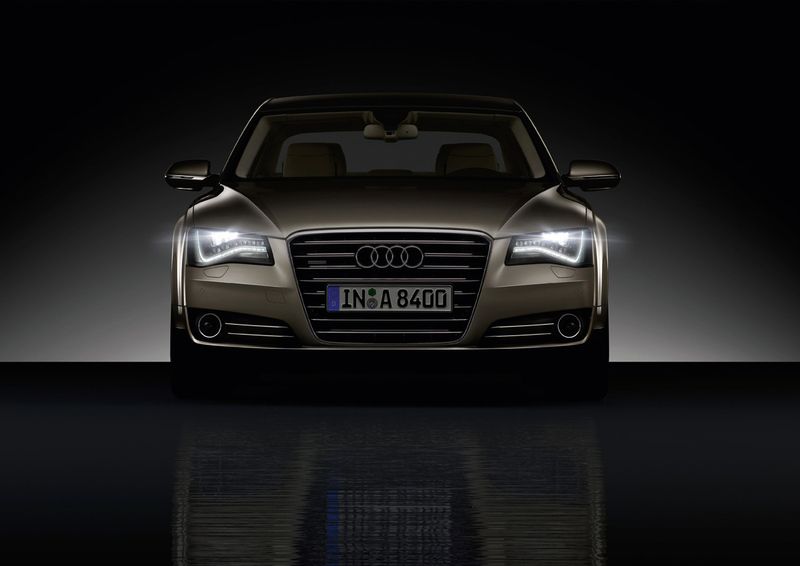 The traditional design continues with the interior of the 2011 Audi A8. A yacht-like beltline is wraps around the interior to create an expansive and open cabin, flowing into the shallow center console. Front seats with 12-way adjustments are standard while plush 22-way adjustable comfort seats are optional with available three-stage ventilation, pneumatic massage, and top stitched diamond patterns. Rear passengers can be treated with an array of optional luxury amenities such as electric blinds, four-zone air conditioning, and ventilated and massaging seats. Five interior colors and three shades of roof lining are available along with a range of leather or alcantara seats, and brushed aluminum or fine woods. At the heart of the instrument panel is a Driver Information System (DIS) and is operated through the steering wheel. The eight-inch MMI display rises from inside the dashboard and displays vivid three-dimensional graphics. 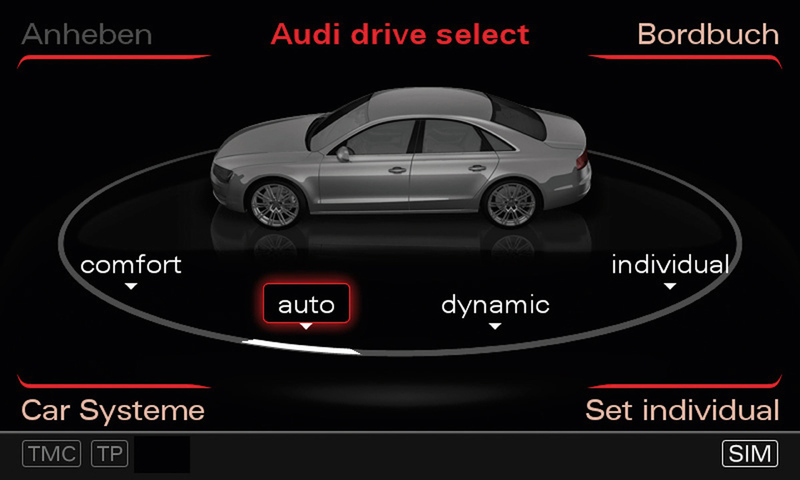 A new touchpad is located above the gearshifter, and operates the Audi MMI system. By drawing characters using your right hand, the touchpad system can recognize destinations, phone numbers, and a number of other functions. 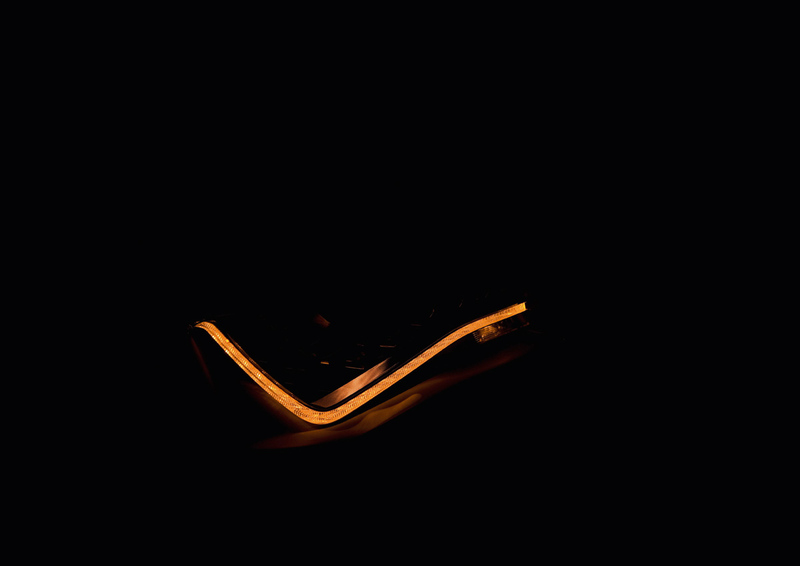 Ambient ruby, ivory, or polar LED lighting create a unique interior experience at night. Adding to the driving pleasure is a standard 12 channel Bose surround sound system with 600 watts and 12 speakers. An orchestra of sound is available with the optional Bang & Olufsen Advanced Sound System. Featuring 19 speakers and 19 channels, the 1,400-watt system offers a brilliantly tuned sound, and showcases two acoustic lenses that rise from the dashboard. 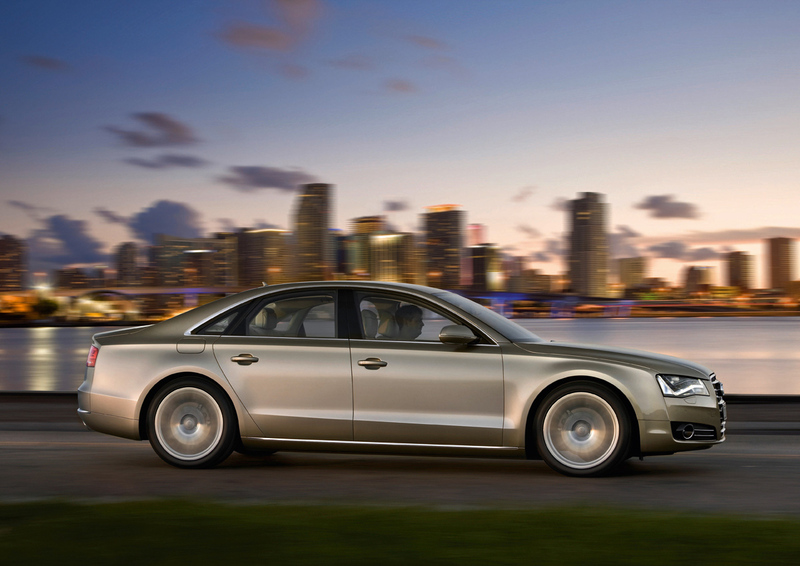 A collection of technologically advanced safety and driving assists are featured in the new 2011 Audi A8. The Adaptive Cruise Control with Stop and Go function works in conjunction with the navigation and radar systems to make anticipatory decisions and assist the driver. Audi lane assist uses cameras and software to alert the driver upon inadvertent lane changes. 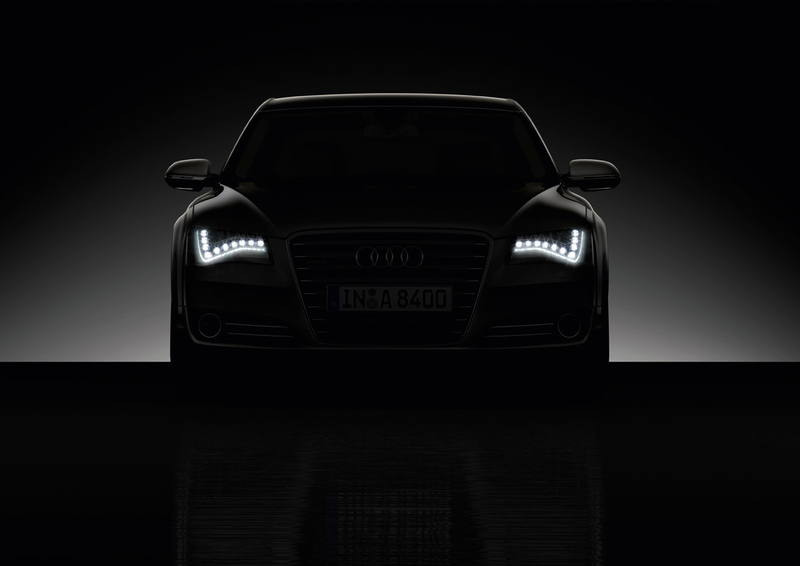 Embedded behind the four rings in the grill, a thermal imaging camera displays images on the instrument display, and is designed to recognize human profiles for safe nighttime driving. 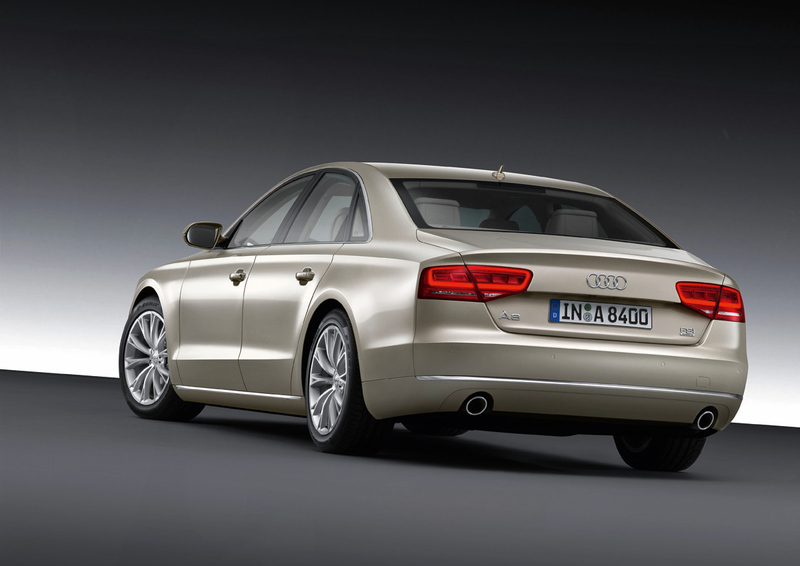 Standard on the short wheelbase 2011 Audi A8 is the signature Audi direct injection 4.2 liter V-8. 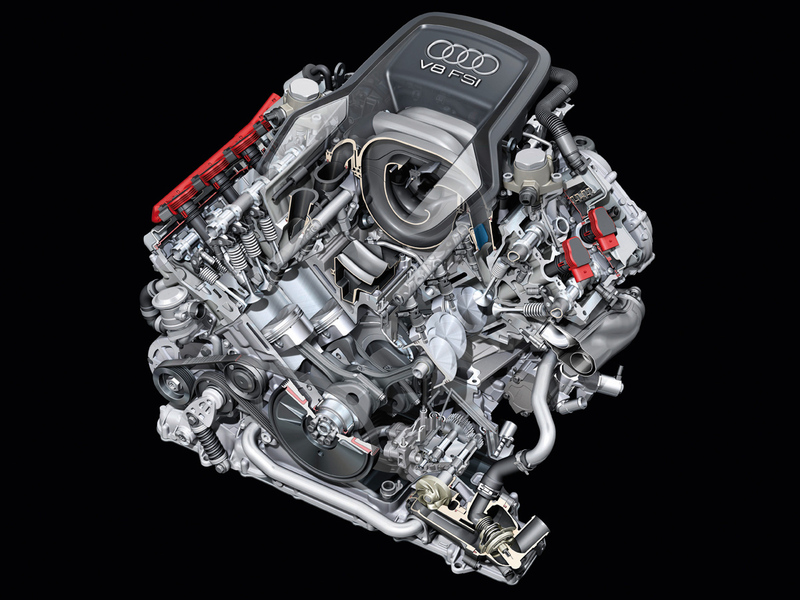 A power increase of 22 horsepower from the previous generation A8 has been achieved with the reduction of internal friction, boosting output to a powerful 372 horsepower. Thanks to Audi’s new modular efficiency system, kinetic energy gained from deceleration is converted into electric energy and stored in the car’s battery. The energy is then distributed by the thermal management system to the transmission, engine, and interior, drastically reducing the warm-up phase upon cold starts. An all-new eight-speed Tiptronic transmission sends power to the Quattro permanent all-wheel drive system. The new Tiptronic shifts between gears quickly with a silk-like smoothness, and reduces fuel consumption by six percent. A strong, yet lightweight aluminum body constructed using Audi Space Frame (ASF) technology creates a sporty and comfortable ride. The lightweight ASF strengthens torsional rigidity by 25 percent over the previous model and reduces vibration, producing a quiet ride. Body panels made from a high strength aluminum alloy save an additional 14.33 lbs. Even the big A8 is going green, keeping with an aluminum construction as opposed to steel because of the metal’s recycling properties. 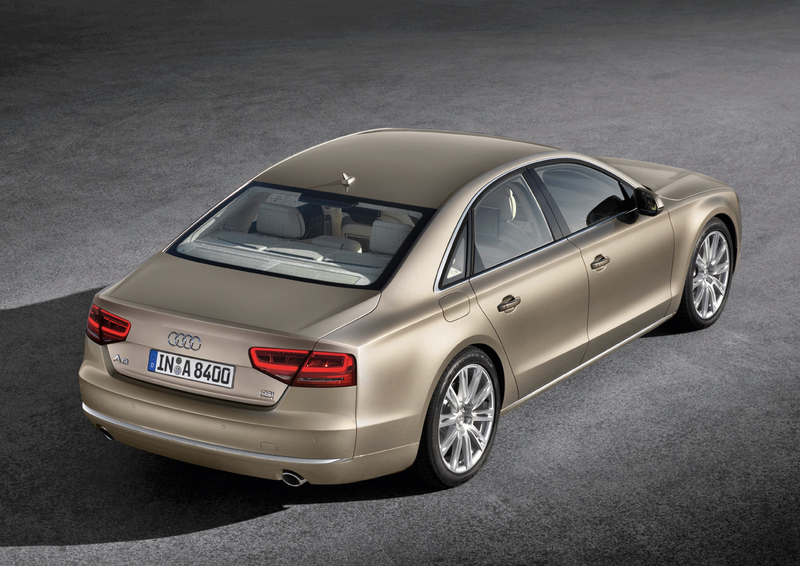 The expression “riding on air” holds true for the new A8 – literally. An adaptive air suspension with newly developed struts allows for a variation of ride quality. The control unit for the shock absorbers analyzes information at a rate of one thousandth of a second to provide an optimal ride. 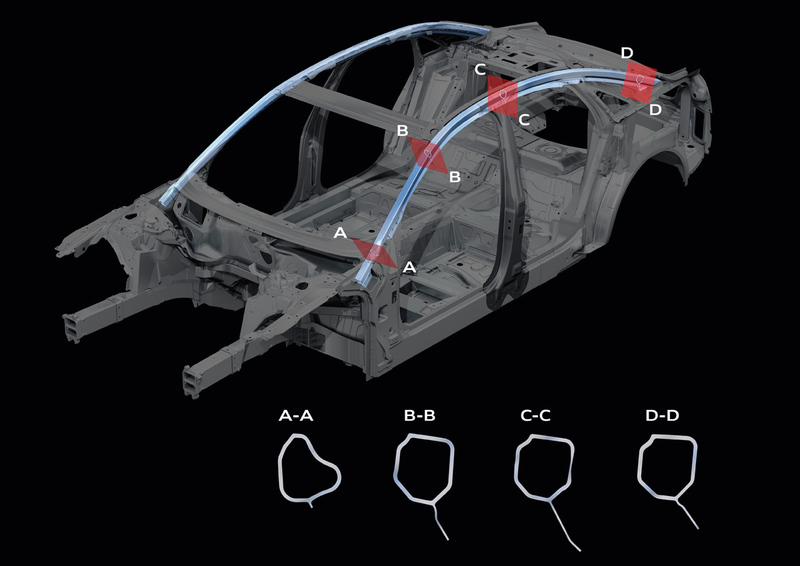 The car can be lowered by 25 mm for greater stability and decrease the drag coefficient at high speeds. 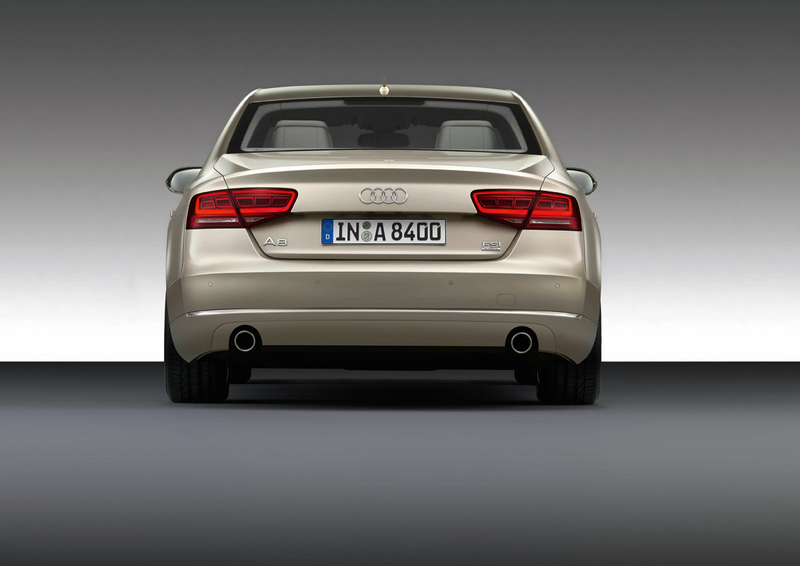 An effective brake system has been designed for the A8 with four internally vented brake discs. A weight savings of 8.27 lbs. per wheel has been achieved with the use of stainless steel rings that connect the friction rings to the brake caps. A range of wheel sizes from 17 to 21 inches will be available in addition to a number of tires. 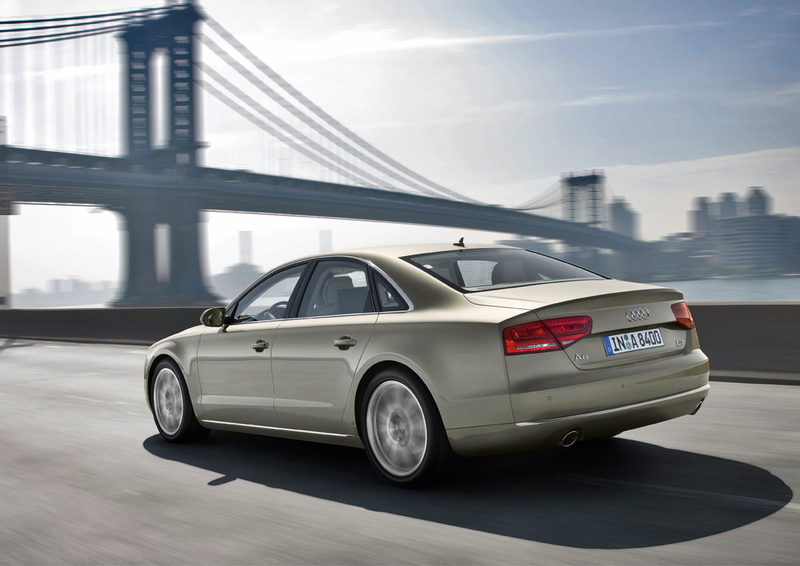 The 2011 Audi A8 will be available for sale in the U.S. during the fall of 2010. An extended wheelbase version is expected to be revealed at the 2010 Shanghai Auto Show, with rumored hybrid and S8 models in the works. 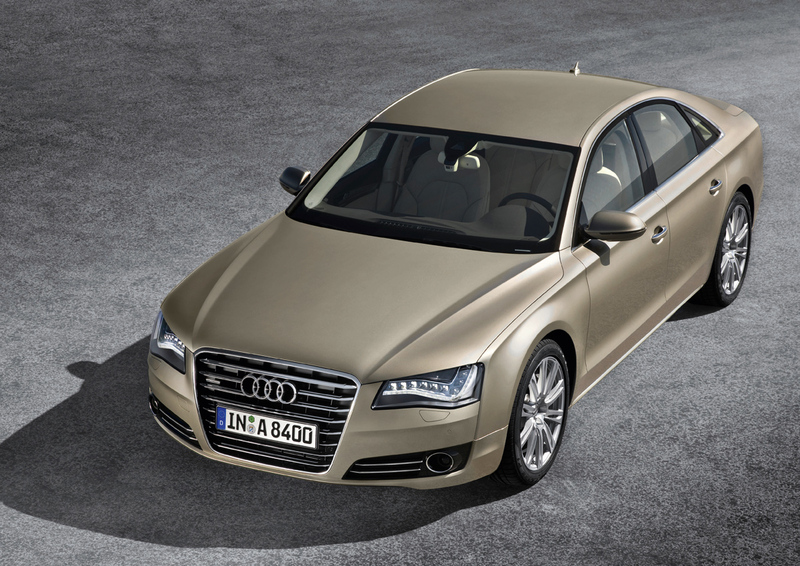 Pricing for the A8 has yet to be released, but expect a base price of approximately $78,000.